High-end Vauxhall Apartments in London is an apartment building. Located in London, High-end Vauxhall Apartments features accommodation with a seating area and a kitchen. Free WiFi is offered. All units are fitted w...ith a dishwasher, oven, a coffee machine, a microwave and kettle. Guests wishing to travel lightly can make use of towels and linens for an additional supplement. O2 Academy Brixton is 2.3 km from the apartment. The nearest airport is London City Airport, 16 km from the property. 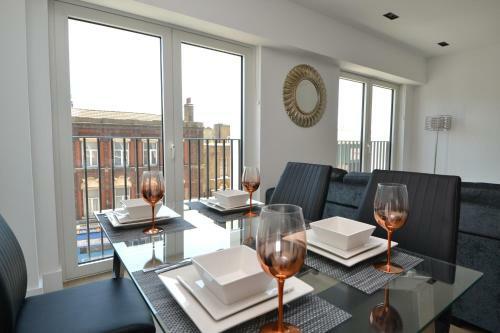 When would you like to stay at High-end Vauxhall Apartments? Guests are required to show a photo identification and credit card upon check-in. Please note that all Special Requests are subject to availability and additional charges may apply. This property will not accommodate hen, stag or similar parties. Please note that it is strictly prohibited to host parties in the apartment. A surcharge of GBP 20 applies for arrivals outside check-in hours.